A giant jaguar relief over 2.8 meters in height was unearthed from the remains of a temple at Huaca Partida in Northern Peru. The temple dates from about 750 BC. The team of archaeologists that made the discovery is led by Koichiro Toshida, 33, an Andean archaeology research fellow with the Japan Society for the Promotion of Science. 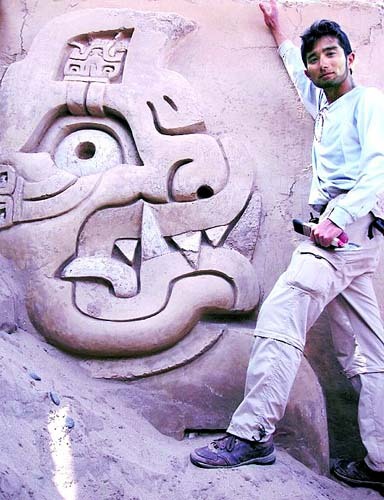 "This is the largest known relief from the ancient Andean civilization, whose ruins commonly feature depictions of animals," Toshida says. The discovery may come to be regarded as a key to unraveling the mysterious origins of Andean civilization. The Huaca Partida ruins are located on the coast about 400 kilometers north of Lima, the capital of Peru. The temple where the relief was discovered stretches more than 25 meters from north to south, and is over 9 meters in height. The temple consists of a three-tiered platform, on top of which is a cloister and a courtyard adorned with eight columns. Two jaguar reliefs were discovered on the south face of the uppermost platform, and the one on the west side was extremely well preserved. The jaguar relief features a head 1.6 meters in height and a maximum engraving depth of approximately 50 centimeters. The ancient civilizations of Central and South America revered the jaguar as a symbol of royalty and supernatural power. The jaguar motif of this discovery is consistent with other mythological depictions. 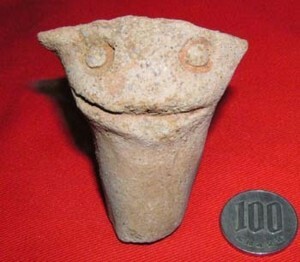 According to Yoshio Onuki, Tokyo University professor emeritus and expert in ancient Andean civilization, "The discovery of a temple in a coastal area that features this degree of embellishment is highly unusual. This discovery calls for a review of the relationship between ruins in mountainous areas and ruins in coastal areas, and will help in understanding how ancient Andean civilization originated."